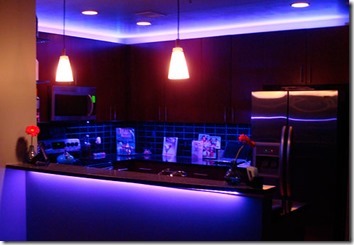 There are many places you can put LED’s strips, however a common use for them is in the kitchen. 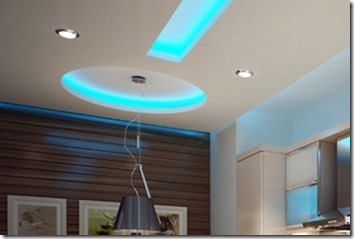 In this article we are going to explore the different places LED’s strips can be positioned and the effect they have. The IP rating of the LED strip you use in the kitchen is really important; for In Cabinet, Under Cabinet, Ceiling Coffer and Shelf Lighting IP20 would be suitable to use because in these situations it is unlikely that the lighting should come into contact with any water. For Plinth and Under Worktop lighting specifically it would be highly recommended that IP65 be used because those are the areas where the strips would likely come into contact with water – even if just splashed, this is still essential. This lighting is usually used for cabinets that have sheer or clear doors to create a specific effect. 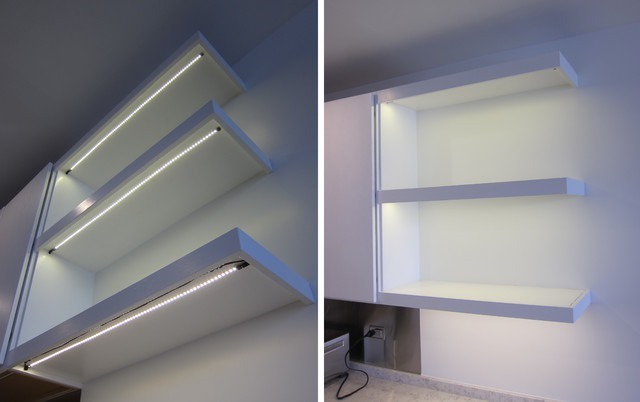 The LED strip will go inside the cabinet illuminating it and, depending on the colour scheme of the kitchen; the LED strip in the cabinet can be changed to fit your colour scheme. 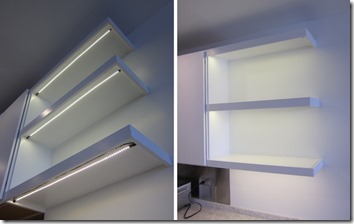 You can also have In Cabinet lighting for cabinets that have solid doors. This will be to light up the inside of the cupboard – if you have glass shelves this will really be effective as the light would filter through the cabinet. Unlike the sheer or clear doored cabinets though, you wouldn’t want these lights on all the time so there is the option to have sensors which would recognise when the cabinet doors are opened and will then turn the light on for you – saving you energy and power by preventing the lights from being on all the time. 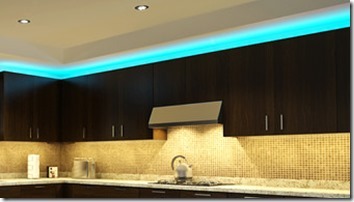 A common use of in cabinet lighting is pictured below; a smaller cupboard has been illuminated to create an effect. 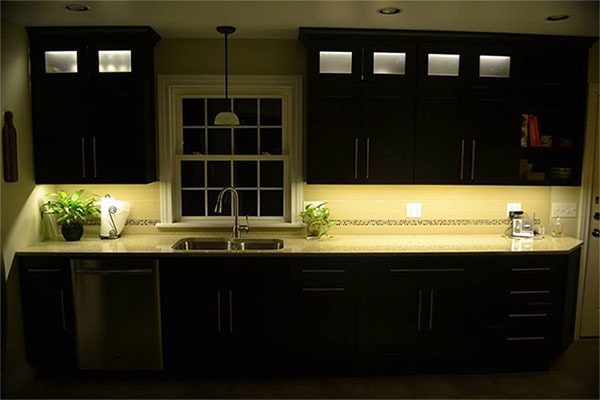 The under cabinet lighting is probably the most common use of LED strips in kitchens – mainly because a lot of kitchens have under cabinet lighting anyway, but using LED strips is more energy saving, cost effective and gives an unbroken stream of light. 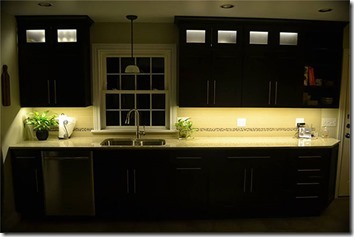 It is a great alternative to lighting up the kitchen without using the overhead light which is flawed in comparison to the strips because it is prone to giving shadows. It gives added light to the worktop’s and, depending on the surface of the work top; it can reflect the light and give the kitchen a more illuminated glow. There is also the option of having the hand wave sensor with the under cabinet lighting; you would wave your hand next to the sensor to turn the lights on and wave it back again to turn them off. This would save there having to be a place for a light switch and would make it easier to provide light no matter what the situation. Pelmet lighting isn’t just specified for the kitchen, but can ultimately be used anywhere in the house to illuminate the ceiling and give more light. In the specifics of kitchens however, it is most commonly used at the top of cabinets to illuminate above. It also increases the illusion of the height to a room. The pelmet lighting is really effective in splashing light up and across the ceiling. This lighting is a personal favourite; it is effective and creates a modern look. Logistically, in order to make the under worktop lighting work and still be effective, you would need a 15mm by 15mm rebate where the LED strip would be placed. The rebate is an indentation made in the under surface of the work top in order for the LED strip to be hidden while also being effective. The strip would have to go on the outside of the rebate though in order for the strip to fit round with ease, and for the light to be illuminated under the work top as effectively as possible. In this picture both Under worktop lighting and Pelmet lighting has been used. 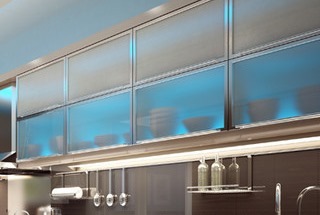 Individual LED lights can be placed under the cabinets to illuminate the under skirt of the kitchen and create an effect. The use of the individual lights would create a more spread out effect as each light would create its own shadow of light. LED strips can also be used in this situation which would be equally effective but would provide unbroken light in the plinth as opposed to separate evenly spread light by the individual fixtures. What you need to look out for when putting in plinth lighting is to make sure you place the lights on the upper edge of the plinth to avoid the LED’s being on show. It is essential you have IP65 because the LED’s could be easily damaged if people knock into the bottom of the work top, island or cabinet. 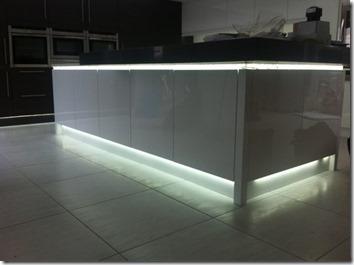 In the above picture, both Plinth lighting and Under worktop lighting have been used. Depending on the layout of your kitchen, your ceilings may have a coffer. This is a section of the ceiling which is slighting further down, or slightly more indented than the rest of the kitchen. In some cases, the coffer can be highlighted with LED strips. This looks very effective and creates an ambiance to the room. In the example shown below, a coloured light has been put in the coffer to add more effect and to match the colour scheme of the rest of the room. Shelf lighting is really effective in lighting up the space below and above a shelf and adding further depth. This type of lighting is most commonly seen in book shelves but is also used in kitchens. Depending on what your shelf is made out of, it would change the effect the LED’s would have and where they would be positioned on the shelf. For a wooden shelf, they could be placed underneath the shelf to illuminate the space underneath. For glass shelves though this would change as the light would shine all the way through so it would be recommended to use the LED strip channel to look more effective and professional. 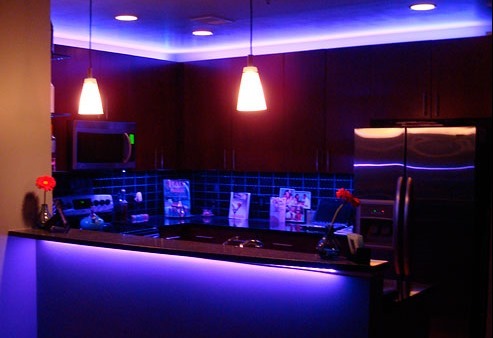 We hope this gives you some ideas of where LED strips can be used and how effective they can be when used in a kitchen! For all our LED strips and related products, click here.